This plugin provides advanced battle command manage functionality that allows you to manage each and every one of your actors’ battle commands. You can choose what commands an actor will be able to use. You can enable or disable commands. This allows you to forcefully disable commands when certain conditions are met: maybe the enemy uses a spell that prevents all actors from using items! You can also hide or show commands. By hiding commands, you can control when actors will be able to see a command. If you are a plugin developer, you can also create your own commands easily and allow other game developers to use them in their games! Additional battle command related plugins! Download ths plugin and place it in the “plugins” folder in your project’s “js” folder. Then open your Plugin Manager (F10), double-click an empty row, and select the HIME_ActorBattleCommands plugin. Let’s take a look at these commands in detail. Note the use of the number 2 as extra data. This is how you specify which skill type to show. Please refer to your “Types” tab to see the ID’s for your skill types. A number of script calls are available for managing commands during the game. You can add or remove commands, hide or show commands, enable or disable commands, and so on. When a command is hidden, it won’t be shown to the player. Where the ID is the ID of the actor, and the SYMBOl is the symbol of the command. If the actor doesn’t have that command, nothing will happen. Where the EXT is your extra data. When a command is disabled, it cannot be selected. If the player tries to select it, the game will simply play a buzzer sound. Where the EXT is your extra data for that command. Hello, does this allow the use of a specific skill right off the battle menu as well? For example, if I had a Lancer with the Jump skill, could I fire that right from the menu instead of say going into a submenu to activate “Jump”? how do I make it so the command is visible when i have that skill type? The advance notetags are not working for the use skills & skill type symbols. Did you find the solution? Looking for it as well. Thanks for the awesome plug-in! It’s just what I needed to make the final fight in my game work just right. TypeError: Cannot read property ‘length’ of undefined. This also happens in my previous save files I have for play testing it, before the final fight with your normal party. Every encounter starts with that message. I am using Yanfly’s plug ins for Battle Core. I have screenshots of the error and the report I get from hitting F8 if that will help. In the game I’m making, there’s ALOT of skill types. So my question is: Is it possible to make submenus with this plugin? For exemple, let’s say that the player chooses a skill type. 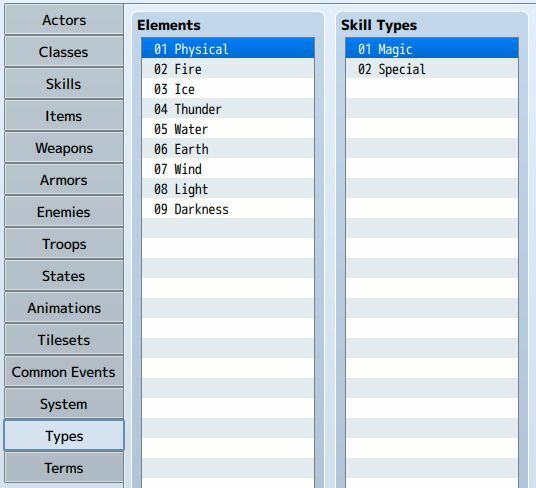 After they choose that skill type, a new list of skill types would become available and finally, after choosing one of the skill types in the new list, a list a skills would become available. Is it possible to do something like that with your plug in? Do you know how I can get Yanfly’s Actor Party Switch to work with this plugin? What’s the problem with Yanfly’s Actor Party Switch and this plugin? When both Plug in are used, the option “Switch” no longer appears at the actor commands window, I guess Hime´s plug is overwrites Yanfly´s. Sorry if I am asking something obvious, but is there a way to make it work with Yanfly’s Equip Battle Skills? I was able to make it work… but, for others, it’d need a quick fix or an extension. That is because the skill_type “number” is ‘battleSkills’, and on line 361 every skill_type number goes through Math.floor, removing it. And now it works, but only on Advanced Battle Commands to set the ext to “‘battleSkills'” since on your check for normal ones the ext is only allowed for numbers. I did your edit however it didn’t work untill I made some edit’s to himeworks plugin.Once I did that I got it to work with both advance and regular commands. the symbol used is “skill” plus no ext needed. The only real bug is if you have as skill that can be equip and you add the skill type to their battle list then it’s accessible through both the equip skills and battle commands. Zarsla, thank you so much!!!! Using Yanfly’s Weapon Unleash Plugin, I had replaced the attack command with other skills, depending on weapon equipped. With this plugin, the plugin will still replace the skill used, however the command still appears as Attack. For example, when equipped with a Cane, the Attack command would be replaced with a skill called Pray which, instead of attacking, would restore some MP to the user. With this plugin, having a Cane equipped will still restore MP to the user, but it still says Attack on the command menu instead of replacing it with Pray. Is there anyway to fix this? Well, I followed @TravelingBard’s post and was able to get my weapons to dictate the type of attack again. Guess I won’t be needing Yanfly’s Weapon Unleash. Although I do wonder if I ever wanted to use the “Unleash” part of that plugin, if it would be compatible. For now though, I’m good. Thanks for this amazing plugin! Yes, I never really thought about how to go about providing a way to sort commands. Actually that isn't due to sorting, but instead the script parses all "basic" note-tags, and then goes and parses all "advanced" note-tags. Basically I was taking the easy way out and just parsing them in two steps rather than trying to find a way to parse both basic and advanced note-tags in one regex. I like the priority idea. It is something I use often in other scripts where you want to specify that something appears before something else, and you want to have some sense of control over it. Secondly, I have a problem with using the commands into a script. Each time I try to disable or hide a command, I got an error: “disable_actor_command is not defined” or “hide_actor_command is not defined”. Do you have any clue? I’m sorry for the double-post but I found out what was going wrong. First off thank you very much for this amazing plugin. It seems like its everything I need right now. A few things I cant seem to figure out despite my best efforts (im sure the fault is on my end). I cant figure out how to rename any battle commands. the way I understood it was that under an actors note section I could put to rename it. Also is this plugin capable of removing the “Fight” “Run” menu that appears when a battle starts? I also would like to add the option for an actor to pass on their turn simply giving the next actor without the enemy getting a free turn in between. Is this possible? I apologize for the questions I just cant seem to find this info anywhere. It removed my code from the post because it thought it was HTML. This is what I thought I could put in the actor tag. It looks like I didn't include it on the description on this page. If you look at the plugin instructions through the "help" section when setting up the plugin, there is a section called "Working with Advanced Battle Command" that provides an example how to customize the command name, among other things. For removing the party commands at the start of battle, no, this plugin does not change the battle sequence logic. You would need a different plugin that will bypass that initial command. If you require a “wait” command, that largely depends on the battle system you’re using. Hey! I was wondering… I’m using yanfly’s subclass plugin and have it enabled where equipping a subclass grants that subclass command. How would i be able to display that subclass command? since currently it doesn’t show. This plugin doesn’t support subclasses as it is. Hi, I’m super-confused as to the location of where to use these scripts. I’m trying to build a tutorial in the game to show how to use a specific skill, and I want all the other commands disabled. Since it’s only for a particular battle (the demo one), I’m trying to call it during a Battle Event. Where do I put disable_actor_command(1, "attack")? A script call. Third page of the event commands. how to enable it again? Hi! I’m getting an error whenever this plugin is on and a battle starts. It says “Cannot read property “length” of “undefined”. I do have a lot of other plugins running too (nearly all yanfly stuff), so that could be it. Any help? Forgot to mention, I literally just installed the plugin and turned it on. I haven’t even tried using any code to utilize it yet. Are you testing with an existing save file? That is likely the issue. There was an issue where using the skill_list command to display all skill types that you can use didn't check whether the skill type was hidden or not. I have updated the plugin to address this issue. So for example, let's say your actor can use Magic and Special skill types. You displayed them all using the skill_list command since you didn't know which ones would be available depending on which traits were applied to the actor. This would hide the first skill type, and it won't be listed even if you use the skill_list command. How do I add a command using the Yanfly plugin ‘Change Battle Equip’? This plugin prevents the command from appearing in the battle menu, and I want players to be able to change their equipment mid-battle. I have added an add-on in the download section that will allow you to manage yanfly’s “Equip” command. The add-on must be placed below yanfly’s plugin. Doesn’t work right now as of latest RPG Maker version and latest Equip plugin version. Gives me ‘invalid battle command type: change_equip’. I do have the Yanfly plugin, and your plugin right beneath it. Never mind, I fixed it. I guess the Actor Battle Commands plugin has to be on or near the top of the added plugin to work. Is anyone else having issues with the “hide_actor_command(ID, SYMBOL, EXT)” function? The thing is, when I call on the script ” hide_actor_command(1, “skill_type”, 1) ” nothing happens. the battle plays out as if I had made no changes. But when I call on the script ” hide_actor_command(1 “skill_list”) it will hide all skill lists just fine! Am I doing something wrong? Has anyone else experienced these issues? For some reason, the plugin doesn’t work anymore. At least, as far as disabling and hiding commands. I’ve even started a new project just to see if it was still having problems, and the plugin won’t even work on a new project, either. Just in case anyone else makes the same mistake… I thought I was supposed to use “Plugin Command”, but after reading carefully, it’s actually “Script”. It’s a script call. I had actually made a brand new project, and STILL used “Plugin Command”, which is why it still wouldn’t work. I was SO sure it was “Plugin Command” until I finally took a look, noticed the help text said to “use a script call”, and after using that, it now works perfectly fine again. I need to disable a skill type if a certain actor isn’t in battle. For example, I want to disable the Black Magic Sword skill type if the Black Mage isn’t in battle. Nevermind. I found it in your useful list of conditional formulas. I tried using the following function, and I got an error. Did I do something wrong? Apparently I was missing quotation marks and “=== true” and I got it to work. Hmm, that sounds a bit strange. Is there a way I can hide a skill type using skill_list in battle, but still have it appear in another location in the command list? For example, there are several attack skills, and the Attack skill type appears first in battle. But it needs to only appear once in the list in battle while still appearing in the menu screen. There’s also two skill types I want to permanently hide in battle for all actors (both skill types are for passive skills). I’m not sure what you mean. Can you provide an example? down for the skills and I just want the one skill called sing to be used not the skills command. what did I do wrong? Are you using the use_skill command or the skill_list command? See the downloads section for a link to the Use Skill plugin. Hi, I’m having trouble with this plugin. I try to disable items and guard from an event, but I get a Syntax error Unxpected end of input. It disables the guard command for actor 5. The “extra data” 2 should be separated from the skill symbol. Sorry, nevermind. I figured it out. The plugin doesn’t work with the battle test. The plugin works fine in battle test for me. Maybe there is a compatibility issue with another plugin. How do I specify extra data? Oops. It is the “ext” property. Sorry, I’ve got another issue. Every time I use the advanced notetag, RPG Maker throws me a ‘SyntaxError: Unexpected identifier’. I’ve turned off all other plugins and copy-pasted the example from the documentation, so I haven’t mis-typed anything, and I’ve also tried re-downloading the plugin, but the error persists. Can you post the note-tag? I wasn’t sure why the commas were there. Now I know. Hmm, I should probably mention that somewhere. Also, I’ve noticed something odd. If the basic notetags like <battle command: item> are used in the same notebox as the advanced notetags, the advanced notetags will appear at the bottom of the command list, no matter the order they’re in in the notebox. This can be solved by using only the advanced notetags, but it’s still strange. Hi, the plugin seems to not be working for me (or more likely I’m doing something wrong). I can define each command in the notetags and that seems to work (for example, if I leave out a command from the class/actor’s notetags the ones I haven’t listed like ‘guard’ stop appearing). But when I use the script call “disable_actor_command(1, “item”)” in a troop or any other combination then nothing happens. I can still select item just fine. It’s definitely Actor 1 i’m using as well. I also disabled all my other plugins, so it doesn’t seem to be a conflict with any of them. No one else in the comments seems to be having this problem though, so I don’t know why it’s happening to me. I must be overlooking something, any ideas? Great work. it seems this plugin is just i needed. in my game the main character have a ‘watcher’ in his side that temporarily can’t assist him during combat excpet healing spell. Good website. Found a lot of bgm. Basically every 温曲 and 冷曲 is pretty good, i like ‘she’ll shoot the moon’, just what i needed! Thanks! Hello, I have an issue with your plugin: actor 1 has the ability to change class during combat (through skill that calls common event), I have set the available commands for each class but when changing commands during combat the default class commands remain (except that the unavailable commands are simply disabled). There is the same issue with your Skill Command add-on where the command from the new class doesn’t show up. Is there a way around that? Am I doing something wrong? Would you be able to update the plugin? Thanks! I am writing to report I am actually getting the same thing ^^’ . I even tried a simple event to hide the command if the actor is another class, but that didn’t work. Like the last time you helped me, I made sure the event was activating by using a message that was showing with the rest of the event. So the message shows, but the commands don’t hide/show with the new class. only the initial class can be affected. Is there a way to hide a command until an actor learn a certain skill? For exemple, until actor 1 learns ice, the Ice Magic command would be hidden or grayed out. Is it possible to do that? This depends on how you learn skills. For fairly simple situations, you can have an event run a conditional branch to check whether the actor has learned a certain skill or not (second page of conditions), and then enable/disable or hide/show commands as needed. For more complex situations, I am currently looking at how you could specify conditions directly for disabling or hiding commands. If you learn the skill from an object for example, is it possible to show the command ONLY if you equip this object? Definitely a bug in the plugin. Both actors are referencing the same class command, which means if you disable/hide that command, all actors will not have it. This is a bug because you're not actually "sharing" the command between different actors; each actor should have their own copy of it. Though, the idea of sharing a command isn't too bad…but I will assume all commands should be independent. I’ve updated the plugin to address the issue. I believe I have found a bug with the plugin. When using the scripts in a conditional branch, the script call being read won’t change when the conditional branch changes from true to false or vise-versa. EX: I placed a command/skill to be shown while a character is under a certain state, and hidden if not in that state. Since, at the start of the battle the character will not be in the state, the condition is false and the command/skill is hidden. Note I did also make sure that the game is checking each turn to make sure the condition is still false or not, but when the condition changes to true, the skill still won’t appear. I have double/triple checked all the settings and even tried to vise-versa the show/hide. Of course I tried it without the conditional branch and even tried a conditional branch that only checks to see if the condition is true. Without the conditional branch it works, but not with it. It just won’t work in a conditional branch :(. Anyway I just thought I’d point that out and see if it was an actual bug or not. Are you sure the conditional branch is actually running? If it works without the conditional branch, I would imagine your condition is never true. Try displaying a message before you show the command to see if the condition actually works. Yay, the problem was that while I had set it to it to turn 0 as the trigger point with each turn checking if the trigger condition is met… I changed it to end turn and added a different event with a turn 0 trigger to hide the command and it works thank you 😀 this plugin is awesome.